Quint certainly had his troubles in that first book, but he managed to outlast his antagonist and lived to fight another day when I sent him to Allendale, SC to track down the “Heartthrob Bandit” in Bring Down the Furies. This book embroiled Quint (pun intended) in a town targeted by a serial arsonist, as well as a cultural war between an archaeologist and an ultra-conservative minister. Along the way, readers learned about the area’s history and how Sherman’s troops burned the original town as it stormed toward the state capitol. My research always turns up a wealth of fascinating background material, much more than I can use if I don’t want the book to read like a history text. For instance, in Hurricane Island, which is set in Cedar Key on the Gulf Coast of Florida, I learned that the Cedar Keys were used by the Seminole Indians, also by the Spanish as a watering stop for ships returning to Spain from Mexico. And pirates like Jean Lafitte and Captain Kidd dropped by from time to time to count their stolen loot. The US Army established a permanent base on Depot Key, later known as Atsena Otie Key, during the Second Seminole War around 1839. Led by General Zachary Taylor (history buffs will recall him as the 12th President of the United State), this became the headquarters of the Army of the South. The base, known as Cantonment Morgan, was used as a troop deployment and detention center for Seminole Indians captured during the war. It all came to an abrupt end on October 4, 1842 when a hurricane with a 27-foot storm surge crushed the Cedar Keys and wiped out Cantonment Morgan. According to the website HurricaneCity.com, Cedar Key has been hit by 36 tropical storms and 15 hurricanes since 1870. Winds have ranged from 46 mph in a slow moving 1896 storm that killed 100 people, to a 1950 hurricane with winds of 120 mph that destroyed two-thirds of the homes on the island. 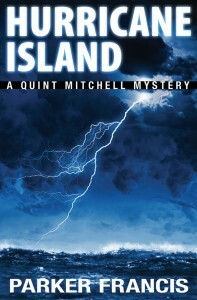 Perhaps now you can see why I titled this book Hurricane Island. You can read the first few chapters by going “inside the book” on the Amazon product page. Enjoy!